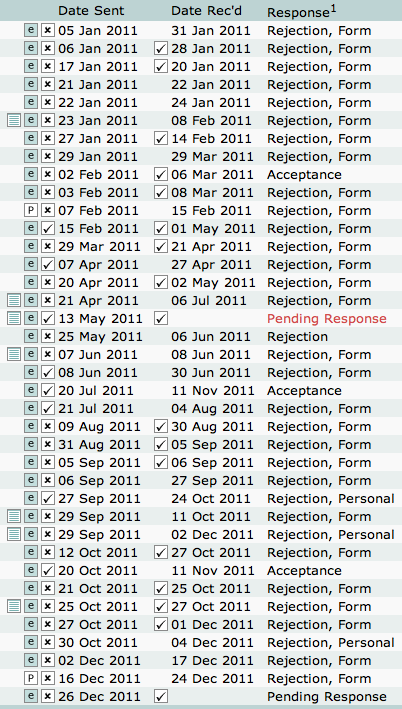 2011 has been an exciting year for me as a writer. I had my first fiction sale, my first podcast sale, and went to my first convention (Boskone). I won a Codex contest, and did respectably well in another. I signed my first autographs, at Readercon. I bought way too many fountain pens. In terms of the actual writing, I submitted 13 stories a total of 38 times (twice as many submissions as in 2010) to 20 markets. I sold three stories, got four personal rejections (again, twice as many as in 2010) and have two outstanding. I did not manage to keep to my goal of at least one submission each month, but I came very close (missing only November). To keep myself honest, I posted my Duotrope listing for the year below, under the cut. I made enough from those sales to buy myself a respectable dinner with a glass or two of wine. I haven’t kept as close track of the number of words, but I figure it’s around 100,000 — a longish novel’s worth. That includes the zombie novella that I shelved, which I plan to get back to, and a healthy start to a novel, which I may not. My goals for the year ahead are pretty modest: I want to at least repeat the performances that are within my control: finish another 10 stories (or, say, 5 stories and a novel? ), get the whole batch onto the market at least 40 times. I plan to attend Boskone and Readercon again. Happy 2012, everyone, and thanks for being around in 2011! Posted in Writing.Tagged improvement, thoughts, writing.